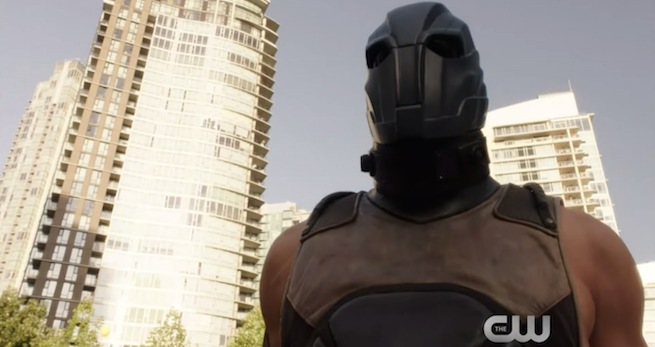 In what looks to be a new TV spot for the Season Two premiere of The Flash, The CW has provided fans with a first look at Atom-Smasher...and the Flash signal? Looking very much like the Bat-signal, The Flash himself appears to be manning a spotlight with his lightning bolt in it. Could he be trying to summon Jay Garrick, another Flash expected to appear in the season premiere? At Comic-Con International: San Diego, producers said that while the particle accelerator explosion had been the main source for introducing powered characters in the show's first season that it would be Earth-2 providing many such characters this time around. It stands to reason that Rothstein's connections to Earth-2 staples the JSA and Infinity, Inc. will be explored.